Here's a subject that I could truly write a book on as there are so many different permutations of colour and size that could work if your salmon fly is presented over a fresh run salmon that's in the mood to have a go. The most important component in salmon fly selection after you've done a bit of basic homework is faith! Most of the bigger salmon fly books have over a thousand different patterns in them so if you really think about it there's a huge clue in that fact alone. Basically all fly patterns that have been registered at some point over the years work when it comes to attracting salmon along with thousands of unregistered patterns too. The key to this intriguing subject is to be a salmon psychologist and think exactly what the salmon are seeing and observe what they are definitely not responding to when the going gets tough. Before you do that though you need to make sure you're targeting the correct zone of the water column and with the correct speed of fly. Let me elaborate on that last sentence. In really freezing early Spring water conditions all salmon will be found holding high in the water column so if you're fishing too fast a sinking head section with too heavy a salmon fly in a slow moving deep pool (as you would do in the Autumn when most salmon are holding deep) you'll be missing the early Spring high water column target zone. 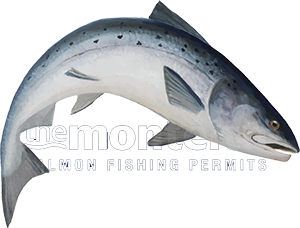 Salmon don't tend to start holding deeper in the pools until later in the Spring when the water starts to warm up. In very cold early Spring water conditions salmon prefer to stick to the higher water column where the warmer water thermals are logically located. The speed of the salmon fly is crucial too in the very cold early Spring water as salmon tend to be much more sluggish when it comes to coming after a fly so a nice steady not too fast fly pace is the most effective one. This is why a 'harled' salmon tube fly from the boat on the Tay is absolutely deadly as the reduced angle and control of the fly's swing pace is always going to be greater than what can be achieved from the riverbank if the boatman knows his stuff. In addition to that fact the boat doesn't lose 15 seconds every minute (including throwing a mend to slow up the fly) as the fly doesn't need to be represented to the river as is the case with a 'riverbank casting' fly fisher. This represents a saving of 25% in effective fly 'swim time' over the course of the full fishing day via the harled 'hands free' traditional Tay boat method. As a former professional River Tay boatman the 'harled' fly through the higher water early months of the Tay's salmon fishing season was absolutely 'deadly' and much more so that the also proven Kynoch, Tomics & in those days Rapalas which have now been replaced by the Vision 110. I was taught by a Tay 'master craftsman' who always 'harled' the fly from the boat on the longest line which probably was part of the reason the harled tube fly did so well as that was the lure keen Spring salmon were seeing first and in the correct area of the water column to make it easy for them to take it. My late colleague Willie Laird was ridiculed for daring to fish a floating line (with a bit of sink tip lead!) and 'harled' tube fly from the boat on the Tay opening day on 15 January 1970 by the new beat owners. By lunchtime the lesser experienced new beat owners had been 'silenced' as their deeper swimming Kynoch's had touched nothing and 6 perfect Tay springers had been taken on Willie's higher fished 'harled' tube fly. There's real skill involved in 'harling' a fly and a big tube fly methodically searching with big wide evenly paced consistent swing movements from the boat was an absolute joy to fish 'remotely' with especially when the harling rod fly reel started to scream! A white full floating long bellied Speyline or double taper 10/11 fly line with a medium weighted spiral lead to take the fly to a foot in depth was absolutely perfect for the early Spring harled tube fly approach. When I was taught it was a thin strip of roofing lead that was twisted onto the end of the fly line that was used to position the tube fly 1 foot under as it was searching. Fly choices on the Tay were much less complicated back in those days and an 'Orange & Yellow' tied on a Waddington or regular 2 inch tube was all you really needed for normal duller low light days. On the brighter light days a 'Gold Bodied Willie Gunn' or 'Black & Yellow' were two other favoured choices by many professional Tay boatmen. Salmon fly selection these days I personally think is 'over thought' as from a fresh run 'good taking' early Spring salmon's perspective this subject is much less complicated. If a fish is going to 'have a go' it's usually a fairly quick decision and at the point the salmon fly will usually be swinging across and slightly above the salmon's holding position so I'll explain in the next few paragraphs exactly what I'm referring to here. When the majority of salmon anglers study a salmon fly their eyes usually go to the head of the fly first of all. When a salmon is seeing the fly and is debating whether or not to intercept it the salmon is looking from a lower position usually at the underside of the tail of the fly as the head of the fly will mainly be obscured from sight. It's highly unlikely as salmon will ever turn its head and gills around away from the stream to study the head of any salmon fly that has already passed it and if it's going to take the fly it will do so when the fly is in front of it. At the optimal moment a fish makes its decision to come off its lie for the fly it will more than likely be at it's closest position to the fish with the fly just starting to pull away. An angled side on view of the fly from slightly below is logically what a salmon see's so this thought might start getting you to look at your salmon flies in a different way. From what I've seen in my career good tail movement can assist with the trickier more educated salmon and a little bit of 'bling' just to give the occasional glint and no more than that is also effective with salmon. Many fly dressers overdo the bling on flies these days which turns the fly into a Christmas tree with the fairy lights full on. Even a Christmas tree looks more inviting to our eyes when the fairy lights are in 'twinkle' mode and salmon from what I've seen prefer the 'less is more' approach too. A soft long fibered schlappen hackle adds even more natural movement to the salmon's underside angled view of the fly's underbelly if your early Spring tube fly needs a hackle. On the fly colour side of things I've seen all colours work at all times of the Scottish salmon fishing season so don't 'over think' the colour side of things and focus more on the swim depth & speed side of things as a salmon will only ever take the fly you're using! Reverse the psychology on salmon when they are proving stubborn and show them something that will startle them. I recall an experience on the Tay where the pool I was fishing was stuffed with salmon and it seemed that regardless of what all the fishers offered them from the normal selection of fly patterns the more they resisted. I pulled out a fluorescent bright purple winged fly with a bright fluorescent orange hackle with a red and pearl 'barber pole' body and hooked and landed 2 of these old stubborn salmon within 5 casts. Over the years I've seen a few tube fly hooking opportunities mysteriously being dropped even though the fly fisher did nothing wrong when attempting to set the hook. If you've got tube flies with super soft plastic sleeves to hold the hook parallel to the body of the tube fly my advice would be to bin them. These soft flexible plastic sleeves can hinge and pivot the hook point right round at the critical moment you apply the hook set pressure dragging the hook points sideways across and right out of a salmon's mouth. Replace them with a more rigid version that will keep the hook point at the correct angle for a solid hook set when the time is right to set the hook.